The following letter was sent by the Palestinian Boycott, Divestment and Sanctions National Committee and the European Coordination of Committees and Associations for Palestine to the EU High Representative Federica Mogherini in protest at an EU official speaking alongside an illegal settler leader at an anti-BDS conference in Israel. This is a shameful move by the EU, showing that it is willing help Israel fight the nonviolent civil society BDS movement for justice for Palestinians, but totally unwilling to take concrete action on illegal colonial settlements or Israeli war crimes. The messagethis sends to Israel is obvious – ‘carry on killing and stealing, you have nothing to fear from us’. We offer our sincere condolences and thoughts to the people of Belgium during this difficult time. 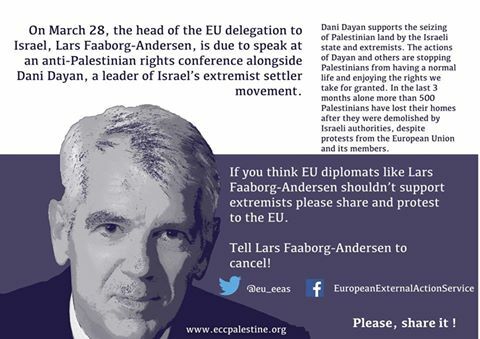 We are writing to urge the European Union to cancel the participation of Mr. Lars Faaborg-Andersen, head of the EU delegation to Israel, in the Israeli “Stop the Boycott” conference, scheduled to take place in Jerusalem on 28 March 2016. Speaking at this conference, hosted by the right-wing, anti-Palestinian Israeli daily Yedioth Ahronoth, would implicate the EU in the latest phase of Israel’s war on the largest Palestinian-led human rights movement in the world: the Boycott, Divestment and Sanctions (BDS) movement. It is deeply concerning that Mr. Faaborg-Andersen will be speaking alongside Dani Dayan, a key leader of the settler movement who advocates for the expansion of Israeli settlements, all considered illegal by the EU and the entire world community. Brazil has recently turned down Israel’s appointment of Dayan as its ambassador to Brasilia. An official EU representative speaking alongside Dani Dayan sends a clear message that the EU in effect tolerates Israel’s planned continued expansion of its colonial settlements, undermining the EU’s rhetorical opposition to Israel’s recent settlement expansion plans and the EU’s legal obligation to uphold international law in this regard. Mr. Faaborg-Andersen will also be joined on the same panel, entitled “Combating the boycott through state action”, by a retired colonel accused of responsibility for enabling Israeli war crimes in Gaza. Regardless of its position on BDS, an inclusive, nonviolent movement for Palestinian freedom, justice and equality, the EU should respect the voice of the absolute majority of Palestinian civil society as well as the voices of a fast growing cross-section of European civil society that stand behind this movement. By sending its Tel Aviv ambassador to speak at this anti-BDS conference, the EU will signal to Palestinians that it has failed, again, to hold Israel accountable for its serious violations of international law and that it is now shamelessly joining Israel in its propaganda war on Palestinian human rights. The EU would do well to emulate the Swedish foreign ministry’s statement that has re-affirmed basic democratic principles by stating that BDS “is a civil society movement” and that “governments should not interfere in civil society organization views”. Israel’s regime of occupation, settler-colonialism and apartheid and its supporters are working hard to persuade European governments to implement anti-democratic attacks on political freedoms of European citizens in order to shield Israel from criticism and effective accountability. In particular, these attacks are focused on BDS. In France, an arbitrary interpretation of a Court of Cassation ruling is being used to falsely claim that all activities in support of BDS are “illegal”, and there have since been a number of attempts by police to prevent demonstrations in support of BDS from taking place. In early March, a solidarity activist was reportedly arrested simply for wearing a T-shirt supportive of BDS. More than 30 activists have faced criminal prosecution simply for urging their fellow citizens not to buy Israeli products. Leading intellectuals in France have condemned this “scandalous” suppression of free speech and upheld the right to boycott Israeli companies and products over human rights concerns. The government of the UK is seeking to restrict local democracy by attempting to intimidate local councils and other publicly funded institutions and prevent them from supporting BDS initiatives. These actions undermine freedom of expression and the fundamental right to protest. They should be of grave concern to all those who value democracy and freedom of speech. This high-profile participation by the EU in Israel’s largest anti-BDS conference to date will undoubtedly entrench Israeli impunity, further the ongoing attacks on democratic freedoms taking place in Israel and in Europe, at Israel’s behest, and undermine the EU’s remaining credibility in the eyes of most Palestinians, Arabs and people of conscience worldwide. South African Archbishop Emeritus Desmond Tutu has once likened singling out Israel’s regime for unconditional military, political and financial support, not to mention protection from accountability, by the US and other western governments to placing Israel “on a pedestal” above every other state. The BDS movement is advocating for Israel to be taken off “the pedestal” and held to account like other states committing similar crimes. 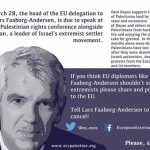 We urge the EU to cancel the participation of Mr. Lars Faaborg-Andersen in the “Stop the Boycott” conference, to take steps to end government repression of the BDS movement, and to meet its legal obligation to end all forms of aid and assistance for Israeli violations of international law. Orginally posted online on the BDS Movement website. Posted March 24, 2016 in BNC, ECCP, EU, EU Guidelines, Open Letter, Press releases, Settlements, Settler Violence, War Crimes, West Bank.